What Is The Best Diet For Pitbulls? How Much Proteins Do Pitbulls Need? How Much Fat Should I Feed My Pitbull? How Much Carbs Can I Feed My Pitbull? Pitbulls are lean and strong dogs originally bred to bait dangerous bulls into the ring. The most appropriate dog food for pitbulls is one that is high in proteins, quality fatty acids and reasonable in carbohydrates. A great pitbull dog food should keep your bully lean and agile while maintaining the body fat low. Taking care of your pitbull means providing all the nutrients and energy your pit needs in order to be able to exercise as much as he/she needs to. A pitbull diet may vary from one dog to the other but there are recommended guidelines we think must be shared. 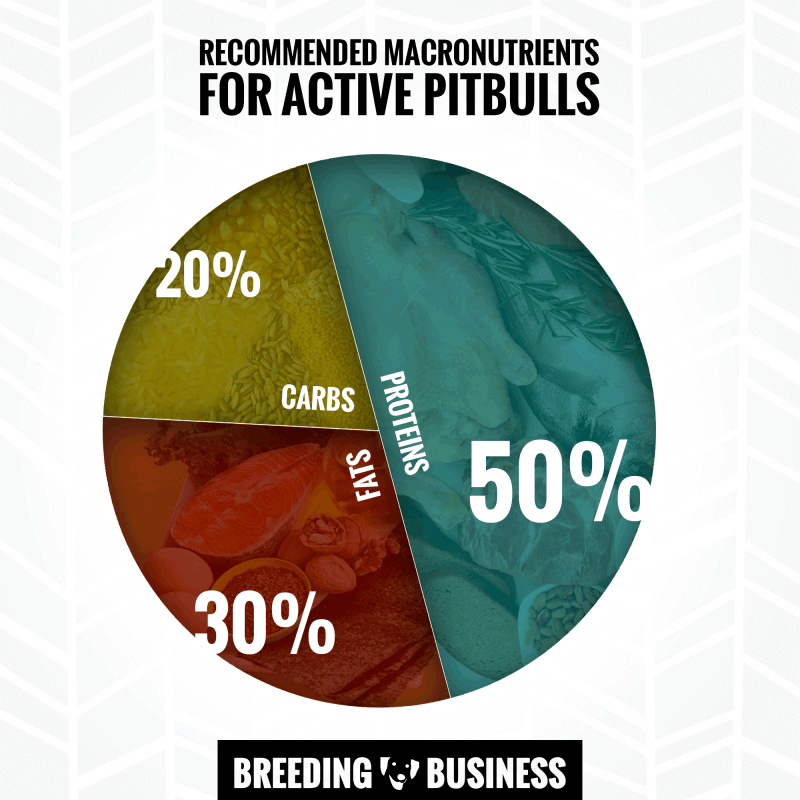 The macronutrient ratio we recommend for pitbulls: 50% of proteins, 30% of fats and 20% of carbohydrates. These macros act as general guidelines for your pitbull dog food; speak to your vet to check if your dog has special needs depending on his health, activity level and metabolism. Proteins are essential to a healthy and functional canine body; they are broken down into amino-acid chains then used in the creation or maintenance of blood cells, hormones, immune response, muscle repair, etc. Proteins and water are the two most abundant molecules in our body — a pitbull must eat a diet providing high-quality proteins to maintain good overall health. The exact quantity of proteins for a pit bull is generally calculated in function to the pit bull's activity level. Regular adult pitbulls can do just fine with around 30% of quality proteins in their diet. For active pitbulls, 50% of proteins must be the target in order to keep the muscles strong and growing. Proteins are made of amino acids and essential amino acids are those that cannot be made by the canine body. These essential amino acids must come from food or they will be lacking. Therefore, the number of proteins ingested matters, but the quality does too. Organ meats are the most concentrated source of just about every nutrient, including important vitamins, minerals, healthy fats and essential amino acids. Some owners and breeders of Pit Bull Terriers prefer to feed raw while others will favor dry food brands we're listing below. It doesn't matter as long as you provide the right amount of quality proteins to your dog. Fat has been demonized for too long and accused of getting dogs, cats, and humans fat. It's only recently that we're understanding better how carbs may actually be more problematic than fats themselves. Do not ban fats from your pitbull dog food! Quality dog food for pitbulls is one that offers healthy fats because dogs use it as a primary source of energy. On top of that, fatty acids help all canines with skin quality, coat maintenance, and most importantly, brain and cognitive functions. As the owner, if you notice your pitbull is gaining weight, don't necessarily change the ratio of 50-30-20 but instead, give less of everything. Providing 30% of fats in your pitbull diet is a great level that is not extreme in any way. Most parts of every dog food for pitbulls have very high levels of carbohydrates (wheat, corn, grains and the likes) simply because carbs are a lot cheaper than proteins or fats. As the pit bull owner, make sure you avoid any dog food using too many low-quality carbs; it's usually used as a filler providing very little health benefits. So now, you're aware of a choice coming soon: buying pricier dog foods for your pitbull but more nutritive, or cheaper and unhealthy. Pitbulls, and dogs in general need to have some carbohydrates in their diet and we recommend a target net number of 20% for most dogs. 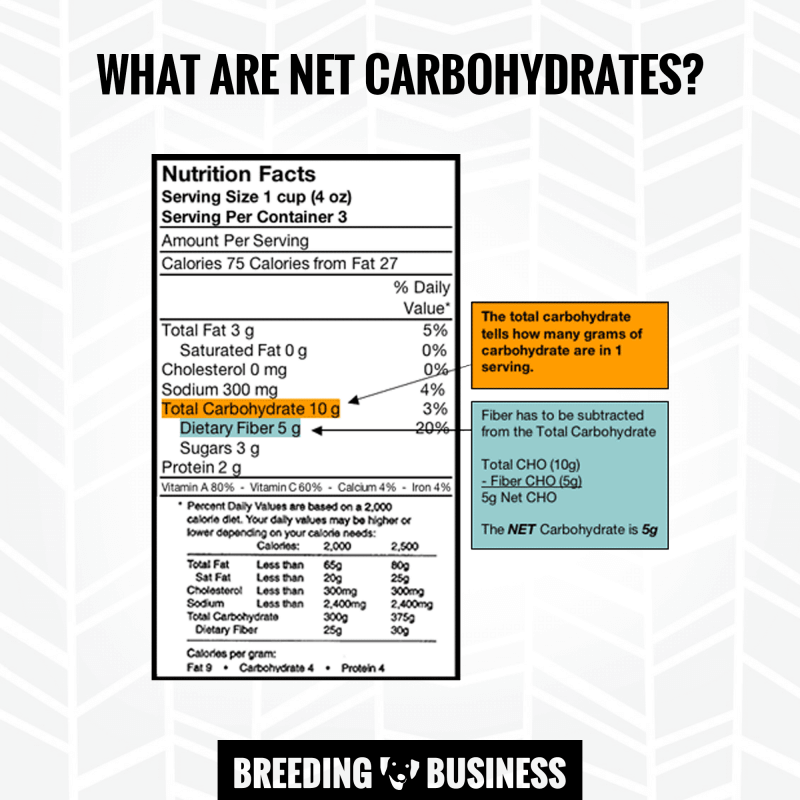 Net carbohydrates are the entire carb content minus the dietary fiber content; dogs just like humans do not use dietary fibers as energy, therefore, you can subtract them from the total carbohydrate content. The net carbohydrate total is the overall carbohydrate total minus the fiber content. In the case of unwished-for weight gains, you may want to increase your APBT's exercise and lower the carbohydrates gradually. It's usually a winning combination for weight loss. 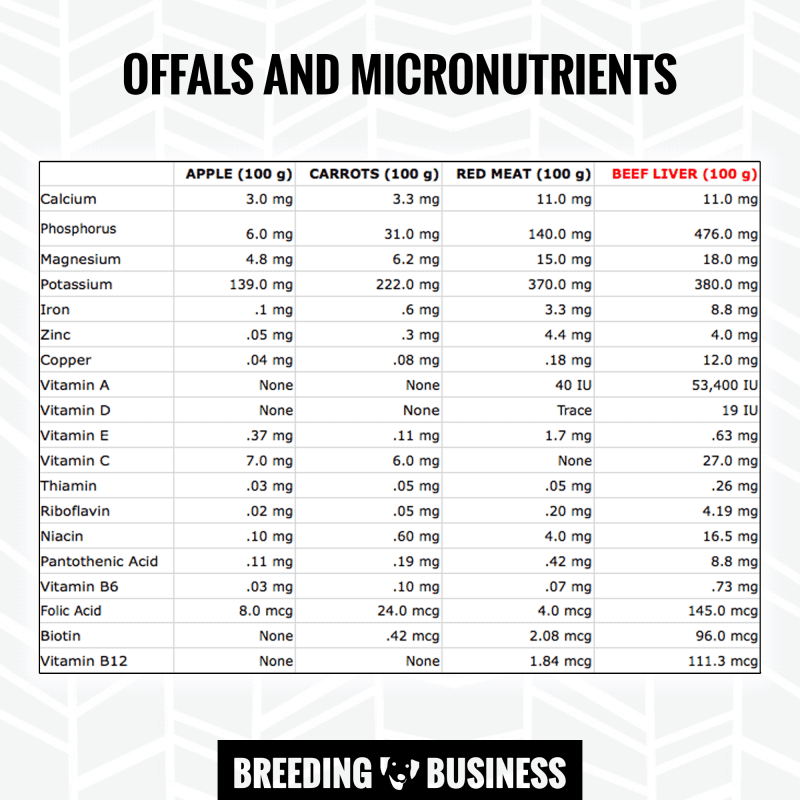 Minerals, vitamins and trace elements all are part of the bigger family called micronutrients. 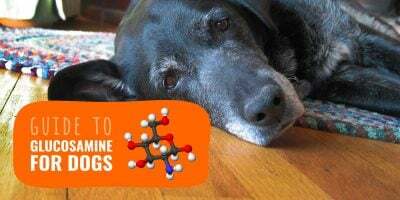 They are required in much lower quantities than the previously described macronutrients (proteins, fats, carbs) but hold an important role in your pitbull's metabolism and the maintenance of all tissue functions. One type of food is particularly great as a source of high-quality proteins, fats and micronutrients altogether — offals and organ meats! The liver is one of the most nutritiously dense food out there. There are hundreds of micronutrients so it is difficult to list them all here but most herbs, vegetables, fruits, condiments, fish and meats will act a great source of a few given micronutrients. Therefore, varying foods is extremely important in order to avoid deficiencies in vitamins and minerals. When buying dog food for pitbulls you must be laser-focused on the first few ingredients and the nutritional values. This is where all the clues are. Unhealthy dog foods for dogs are clearly those providing a ratio of macronutrients that wouldn't make any sense with today's scientific knowledge. Most cheaper dog foods are packed with excessive amounts of carbohydrates and to top this up, the protein content comes from low-quality meat by-products. There is no scientific evidence in what I have read showing grains are bad for dogs; however too many grains are clearly unhealthy in the long run. Avoid corn, wheat, and soy in your pitbull food as they are common fillers offering nearly no health benefits whatsoever. 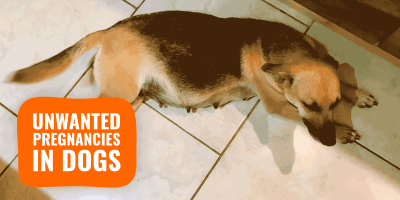 Food allergies in dogs and pitbulls seem to be a rampant issue growing every year passing. Most accusations blame too high carbohydrate levels found in most kibbles, and I do agree. This is why our recommended ratio favors proteins and fats over carbohydrates. Time for the showdown of the best dog food for pitbulls! If you are living a busy life and have barely any free time to cook for yourself, you will find it hard to prepare homemade dog meals. There are wonderful premium dog food brands out there that would work amazingly well for pitbulls. 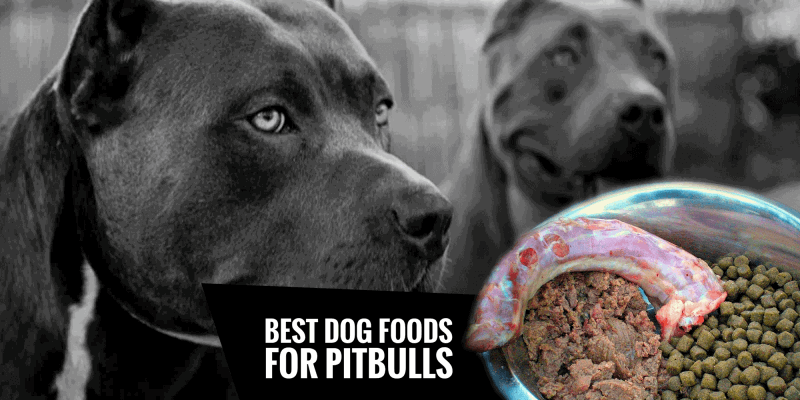 Here are our best dog foods for pitbulls in order of preference! 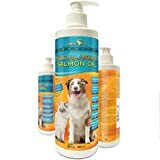 It couldn't get any better for pitbulls: high-quality proteins, grain-free, complex carbohydrates, and roasted bison and venison, antioxidants, omega fatty acid blend, fibers, chelated minerals and a selection of premium ingredients. Probably the absolute best dog food for pitbulls available in 2017. by far. Made in the United States, Taste of the Wild's put each ingredient through at least 151 quality assurance checks before using them, this is to make sure only the best and safest ingredients are used. Yes, it's certainly not the cheapest but try it out over three or six months and see the results for yourself. Just like most successful athletes don't eat each meal at McDonald's, an athletic canine shouldn't be fed with cheap kibble. 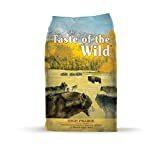 Taste of the Wild Canine Formula also has massive palatability so transitioning to it from any dog food should be an easy task. Fish is a wonderful source of top protein for dogs but also provide healthy fatty acids and plenty of micronutrients. This Ocean Whitefish, Herring & Salmon Recipe is a winning formula for pitbulls in need of an all-natural diet focusing a little less on red and white meat. Totally grain-free, it is instead packed with nutritious complex carbs from peas, potatoes, and spinach which boosts its fiber content, too! We appreciate the fortification in vitamins, minerals, probiotics, and antioxidants to avoid deficiencies in the long run. 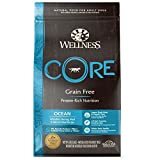 As a very well-respected dog food manufacturer, Wellness Core guarantees that this dry food contains absolutely no meat by-products, artificial colors, flavors and preservatives. Obviously, there is no wheat, corn or soy either. 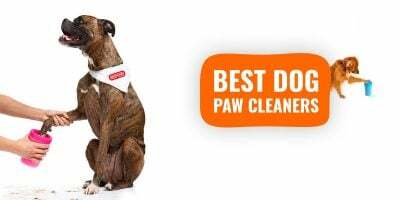 Kibble and dry dog food for pitbulls sometimes fail; so we've shortlisted a wonderful wet dog food that your pit will love. This premium wet food works perfectly with sensitive pitbulls who react unpredictably to some dry foods thanks to its natural, holistic and limited ingredients. Made in the USA, this Blue Buffalo Freedom Grain-Free canned dog food is packed with chunks of real beef and excludes all meat by-products, artificial preservatives, colors or flavors. It's definitely a must-try. Arguably the absolute best dog food for pitbulls in our list but in the last position because of its price. Expensive, very expensive. But incredibly good and healthy for pitbulls. If you can afford it or want to try it, don't even hesitate but if you cannot, check the above three options. Why is it so good? The manufacturing process used is dehydration: it's a minimal way of preparing dog food that leaves nutrients intact and highly digestible. Most other dog foods are overcooked and powdered which results in the loss of most of the nutrients displayed on the label. Not here, not with The Honest Kitchen Dehydrated Range-Raised Beef. 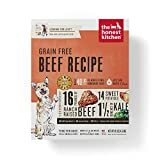 Naturally, it's a grain-free dog food for pitbulls that includes range-raised beef as the first ingredient. It's the real deal. The carbs come from high-quality sweet potatoes and papayas and cranberries. Great fatty acids come from organic flaxseed and coconut. The ingredients list is so good that this is a human grade dog food — meaning you could eat it yourself! American Bullies and Pitbulls are athletic dogs requiring a particular diet, different from any other dog breed, that should be high in proteins and fats but low in carbohydrates. Dehydrated, freeze-dried, wet or regular dry dog foods for pitbulls exist in huge numbers making it difficult to choose the right dog food for your particular pitbull. 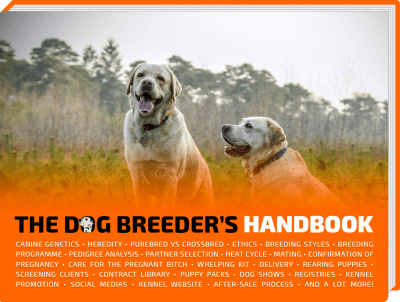 Our list of recommendations has four dog foods and three different methods of preparations. Pick what suits your budget and your pit bull! If you have deep pockets, go for The Honest Kitchen; but if you cannot spend $100's, go with the Taste of the Wild Canine Formula.